The latest version of Google’s digital atlas, Google Earth 6, now incorporates the Street View functionality from Google Maps allowing users to zoom down to the street level. 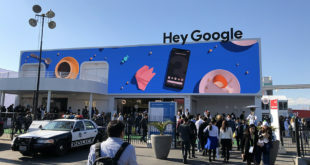 "Now, you’ll notice that Pegman is docked right alongside the navigation controls—an ever-present travel companion ready whenever you want to get your feet on the street and take a virtual walk around," said Gogle representative Peter Birch on the Google Blog. "Just pick up Pegman and drop him wherever you see a highlighted blue road to fly right down to the ground." Google have also added other features such as detailed 3D trees into parks and cities around the world. Google said that it had added over 80 million of the virtual trees which it says are photo textured versions of real species of trees. The trees appear in places such as San Francisco in the Golden Gate Park, Chicago in the Grant, Millennium and Lincoln parks, New York in the Prospect and Riverside parks. In Europe, Athens and Berlin have been greened up Google style while in Japan Tokyo has also had had the virtual tree treatment. Google have also made it easier to access ‘historical imagery’, such as peering back in time to see London in 1945 and Warsaw in 1935.